Phillip Jack Brooks better known as CM Punk, is an American mixed martial artist, comic book writer, and retired professional wrestler. He began backyard wrestling in the 1990s with his brother and friends before enrolling in wrestling school. CM Punk was born on October 26, 1978, in Chicago, Illinois and raised in nearby Lockport, Illinois. His father was an engineer, while his mother was a homemaker. His father was addicted to alcoholism. Regarding his educational career, we have not any detail information. In his early childhood, he attended Lockport Township High School. He attended the "Steel Dominion" wrestling school in Chicago, where he was trained by Ace Steel. 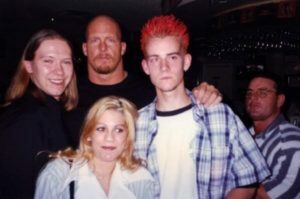 in the mid-late 1990s, he was a stint in a backyard wrestling federation called the Lunatic Wrestling Federation with his friends and brother Mike Brooks. He first started using the ring name CM Punk with CM Venom. He left federation and attended at the "Steel Dominion" wrestling school in Chicago, where he was trained by Ace Steel. During these days he is associated to Independent Wrestling Association Mid-South (IWA Mid-South). He becomes IWA Mid-South Light Heavyweight Championship twice and the IWA Mid-South Heavyweight Championship on five separate occasions. Punk wrestled for Japanese promotion Pro Wrestling ZERO-ONE on August 1, 2003. Ono October 2003, Punk was hired as the first head trainer of the Ring of Honor wrestling school. He faced ROH World Champion Samoa Joe for the championship in a three-match series. In September 2005, he was assigned to Ohio Valley Wrestling (OVW), a WWE developmental territory and became the OVW Television Champion after defeating Ken Doane. In the final of OVW Heavyweight Championship Brent Albright vs. CM Punk and defeating Brent Albright Punk become the new champion. WWE.com stopped advertising Punk for future events because he is going home. At UFC 181, on December 6, 2014, Punk signed a multi-fight contract with Ultimate Fighting Championship (UFC). On December 6, 2014, Punk announced that he had signed a multi-fight contract with Ultimate Fighting Championship (UFC) at UFC 181. When asked if he would compete under his ring name or birth name, he told the Las Vegas Sun, "I've come this far with CM Punk. That's what people know. I'm trying to stick with that. I'm not shying away from it. I'm not ashamed of it." Punk began training under Duke Roufus at Roufusport MMA Academy since January 2015. In June 2015, he moved to Milwaukee to be closer to the Roufusport gym, while still retaining his home in Chicago. Later, it was announced that Punk would compete in the welterweight division. In October 2015, Roufus announced that Punk had suffered a shoulder injury, delaying his UFC debut until the next calendar year. On February 6, 2016, it was announced that Punk would face Mickey Gall in his first professional mixed martial arts (MMA) contest. Days later, he was diagnosed with a herniated disc, and underwent surgery. CM Punk got married to his longtime girlfriend April Mendez, better known as AJ Lee, on June 13, 2014. They split their time between homes in Chicago, Illinois, and Milwaukee, Wisconsin. As of 2017, CM Punk has an estimated net worth of $7.5 million. On March 17, 2017, Vitor Belfort announced that he wants a Squash Match with CM Punk for His Final UFC Fight. After getting demolished by Kelvin Gastelum, Belfort came up with the idea of a legends division to better suit aging brawlers like himself. However, CM Punk, who has retired in 2014 has not replied to the challenge yet. Cm Punk has beaten hHh, brock Lesnar & Samoan Joe . Vitor is nothing compared.